Last week at its grand opening celebration, Dogs for Better Lives unveiled its new facility to the local Medford Chamber of Commerce, local elected officials, community members, and past and current donors from around the country. Energy Trust’s Jessica Iplikci, senior commercial program manager, presented about Energy Trust’s support for this successful project. Located in Central Point, Oregon, Dogs for Better Lives is a nonprofit that trains and places assistance dogs with individuals who are deaf or who have hearing loss, children on the autism spectrum, as well as special needs students and individuals who benefit from the dog’s calming presence. Formerly known as Dogs for the Deaf, the organization has provided over 1,300 assistance dogs to people across the United States since it opened its doors in 1977. To help the nonprofit reap long-term savings from energy-efficient upgrades, Energy Trust provided it with over $13,000 in incentives for their interior and exterior LED lighting. These upgrades will save the organization $7,000 in energy costs annually, enabling funds to go toward training and caring for more dogs, expanding its national presence, empowering its employees and ultimately making a difference in more people’s lives. This 40-acre site will provide space to house more dogs, as well as room for modern and open training spaces that allow the dogs to be coached in advanced, real-world scenarios. 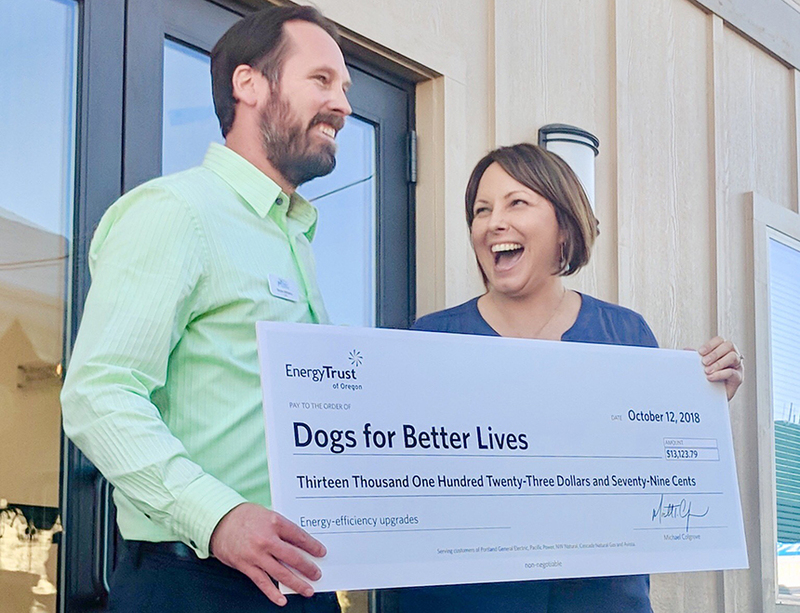 Energy Trust is honored to work with Dogs for Better Lives to reduce overhead costs and help the nonprofit achieve its mission. To find out more about cash incentives for your business, visit: https://www.energytrust.org/programs/new-construction-major-renovations/.